Registration is now open for 2018 Tour of the Gila. Register by January 14, 2018, and get a 10% discount off the entry fee. Also, for the first time, there are team discounts available. If you area USA Cycling amateur team or a shop team and you plan on bringing 10 to 15 riders to the 2018 Tour of the Gila, then there is a 20% discount off every team member’s entry fee. After January 14th, 2018, the team discount will be 10% off every team member’s entry fee. This year, every racer will receive a 2018 Tour of the Gila Swag Bag that will include a 2018 Tour of the Gila T-shirt, a 2018 Tour of the Gila pint beer glass, and a 2018 Tour of the Gila poster. Tour of the Gila is proud to announce that the iconic part of the Mogollon race has been reinstated to this year’s stage 1. Since the race’s inception, for the exception of last year, the first stage of the 5-day race had finished up a 6.7 mile climb that peaked at a 19% gradient route to Mogollon. Last year, due to major road construction in the ghost town of Mogollon, the stage was slightly shortened, concluding on White Horse Mesa. This year the stage will take riders up the challenging climb to what is sure to be a notable finish. You know racing is good here in the Gila! 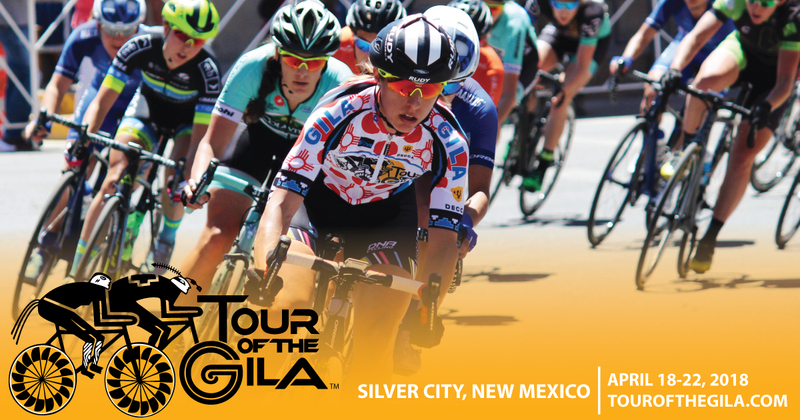 It is always a special week here in Silver City when the Tour of the Gila in town. We are looking forward to having you and your family join us in mid- April. Register Now to be a part of this year’s “Gila Experience”.